I have fond memories of exploring as a child. I was lucky enough to live in a small town in Alaska with lost of wilderness around me, so it wasn’t hard to just hike back into the woods and feel like you were in some secret place where no one had ever been. So, the Poppets are off exploring today in this outfit designed for the occasion complete with a bag to carry back treasures in and a bunny companion. I had a stuffed bunny as a child named Mr. Bunny (I still have him) and so I have always had a fondness for stuffed bunnies. 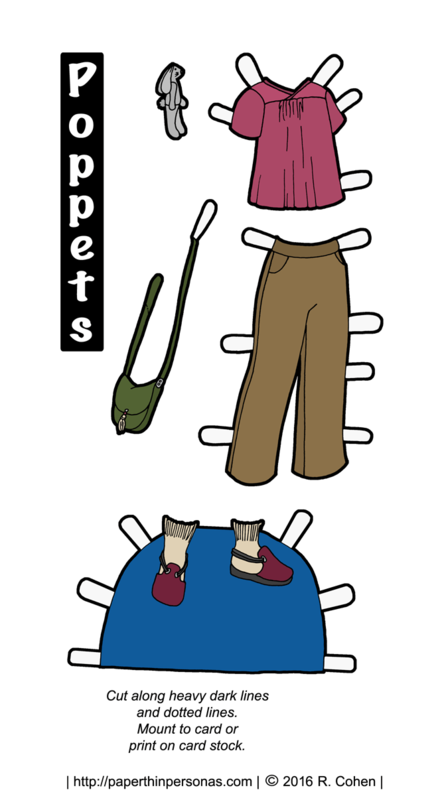 Today’s paper doll’s shirt is based off an Oliver + S sewing pattern called Hopscotch Skirt and Knit Top. I’ve always had a fondness for Oliver + S, because they used to use paper dolls in their pattern packaging. Her shoes were inspired by this Fig & Me doll’s shoes. So, my question to all of you is this- Did you have exploring adventures when you were a child? And where did you go to have them? As always, if you love the blog, then think about supporting it on Patreon. the stuffed bunny is adorable. and as always, you come up with the most interesting and wonderful shoes! I grew up in suburban Florida, but was lucky enough to have a nature preserve almost in my backyard. I loved seeing all the alligators, birds, and snakes in the wild. Once I even saw a bobcat. Though now I think about it going back there in flipflops was a really bad idea. Oh yeah, I look back on some of the stuff I did and I am like, Dang, How did I not hurt myself? Awww, they don’t have the paper dolls anymore? That’s a shame. I loved their patterns when my daughter was little. Yeah, I haven’t seen them on their latest packaging. I confess I might have bought a few just for the paper dolls, because I have a PROBLEM.